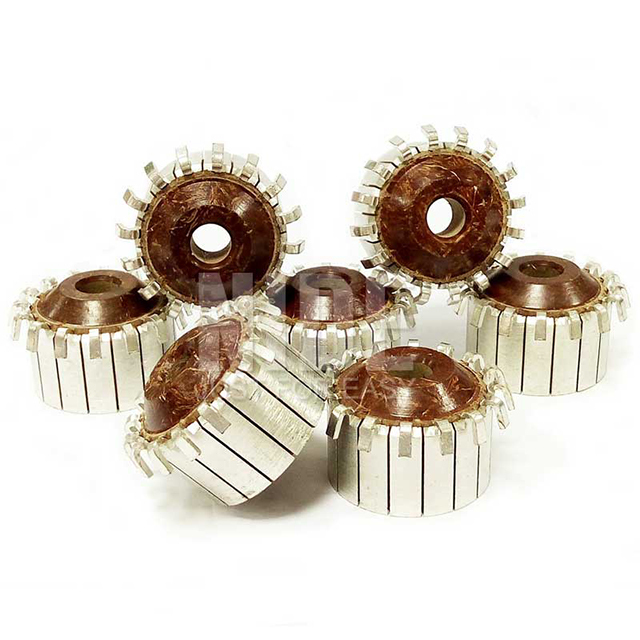 Motor Electric Commutator-Ningbo Haishu Nide International Co., Ltd.
Nide produces more than 1200 different types of commutator, including hook type, riser type, shell type, planar type, ranging from OD 4mm to OD 150mm. The commutators are widely applied to automotive industry, power tools, household appliances, and other motors. 1. Voltage test: bar to bar 500V, bar to bore 1500V, without breakdown and flashing. 2. Spin test: do spin test for the commutator under 140 centigrade, the speed is 5000RPM, the test continues for 3min. After testing, the deviation of outer diameter is less than 0.015, the deviation between bar and bar is less than 0.005.